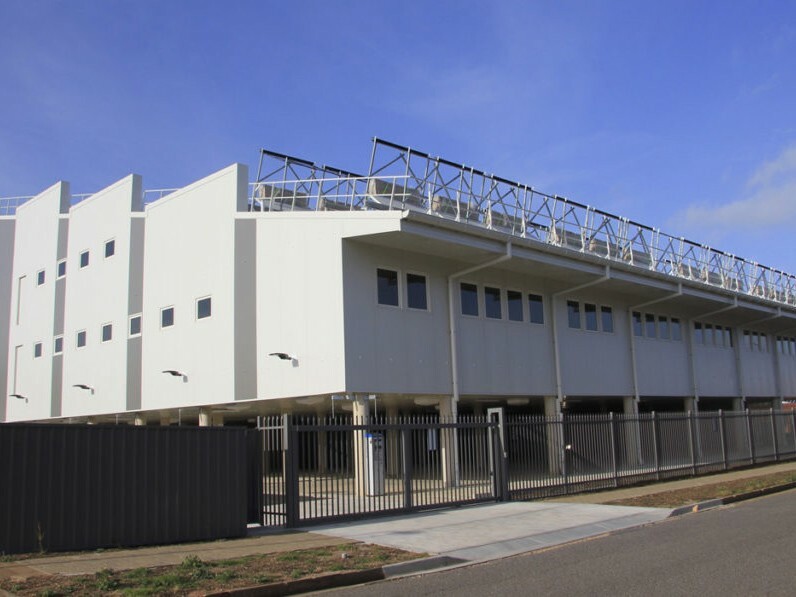 The $8 million Fluid Solar headquarters in Adelaide’s northern suburbs contains more than two megawatt hours (MWh) of energy storage capacity, comprising about 90 percent thermal storage with the remaining 10 per cent provided by conventional battery storage. Fluid Solar House has been operating without the use of the electricity grid since April to test its technologies before this afternoon’s cord-cutting ceremony. The building, pictured below, will be used as the small company’s headquarters but will also become a co-working space for other innovative northern suburbs’ startups. Surplus electricity generated at the site will be used as part of Tesla’s car-charging network, with provision of 11 electric vehicle bays that will be charged completely by wind and solar power harvested from a 98kWp array of 378 PV solar panels on the building’s roof. A sustainable “tiny house” has also been built – in just three days – in the building’s car park to showcase the company’s low cost, low energy accommodation. Fluid Solar Managing Director Roger Davies has been working on the technology since 2008 and said the solar thermal element was the key to the building’s success. He said solar PV cells alone typically could not produce enough energy to run an air conditioning system. “Even if you could, the cost of the battery pack becomes so large that it’s difficult to pay the battery pack off before it wears out,” he said. “Storage of heat is dramatically cheaper than battery storage and because we’ve got the other end, which is the devices that use thermal energy directly for their heating and cooling it means that 60-70 percent of the building’s energy requirements are met using solar thermal as opposed to solar PV technology. Wind turbines on the roof are also in place to fill the void for about 20 days in winter when long stretches of cloudy weather reduce the effectiveness of solar. The surplus electricity will be used to power the car charging station. The solar thermal collectors have been granted an Australian patent and we’re in the process of getting an international patent in several jurisdictions including China, India, Japan, North America and Europe. They work by heating rainwater collected at the site to between 60C and 90C and storing it in a 10,000-litre insulated box. The hot water can be used to directly heat the building in winter and indirectly in summer to dry air and run evaporative cooling. The building also has a turbine that turns low pressure steam into electricity. “If you collect solar energy as heat, you store it as heat and you use it as heat, the whole process is intrinsically efficient and cost effective and that is the trick to moving to a much lower energy consumption society,” Davies said. The company is working on a system that can be retrofitted to existing office buildings. Fluid solar has a 1200sqm factory in the nearby industrial suburb of Edinburgh. It has 24 orders for small houses, which range in size from 40sqm to 160sqm. The houses are powered by similar renewable energy systems as the office building, can be run off-grid and can be built on site in a matter of days. “Our order book is probably filled till Christmas but we’re certainly looking to have some projects moving into 2018 to keep the momentum going and build production,” Davies said. Davies said the small modulated houses had a number of markets including as backyard granny flats, off grid holiday homes and housing for people on fixed incomes. He said the fast build times, low or no ongoing electricity costs and a price of about AUD$1000 per square metre compared with $1200 – $1800sq m for traditional housing made them very affordable. Fluid Solar has approval to build a 20-apartment complex in Munno Para, which Davies hopes to have installed before Christmas. “One thing I would very much like to do is build these as medium density urban and suburban housing because we believe we can get the cost down to a point where people on low fixed incomes can afford to rent or buy over time,” he said. South Australia leads the nation in the uptake of wind energy and roof-top solar with renewable sources accounting for more than 40 per cent of the electricity generated in the state. However, the closure of two coal-fired power stations in recent years has increased South Australia’s reliance on energy supplies from the eastern Australian states, particularly in times of peak demand. Last month, tech billionaire Elon Musk announced his company Tesla would install the world’s biggest lithium-ion battery at a wind farm in South Australia. This month, SolarReserve announced it would construct a 150MW solar thermal power plant in the state’s north. Printed with permission of The Lead.